Exposé Online » Reviews » Marc Ribot's Ceramic Dog - YRU Still Here? 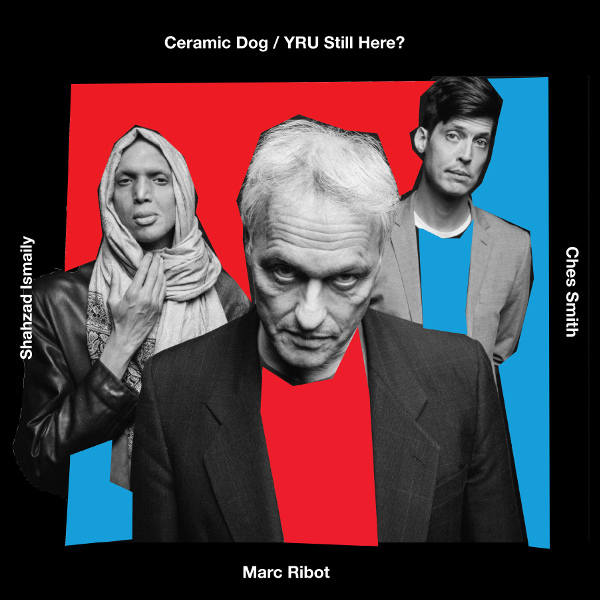 Marc Ribot's Ceramic Dog — YRU Still Here? Guitarist Marc Ribot has a recorded history that is so diverse as to be of little use in predicting what a new album might sound like. His group Ceramic Dog consists of Ches Smith (drums, percussion, electronics, vocals) and Shahzad Ismaily (bass, synth, percussion, vocals), two members of Secret Chiefs 3, so it would be reasonable to expect some features of that band’s experimental pan-global genre-stew to be present. That expectation is fulfilled in numerous ways and infused with a ragged, angry punkish energy more concerned with angsty expression than precisely rendered compositions. Rhythms touch on funk, dub reggae, African, Middle Eastern, and thrashing rock, all spliced together in varying ways. Ribot’s playing has a core of blues, folk, and rock, but mutated with a lot of atonal noises and dissonance, that has won him many jobs as a sideman (Elvis Costello, Tom Waits, John Zorn, David Sylvian, and more). In addition to this wild guitar work, he contributes Farfisa organ, a bit of bass, and vocals. Guests provide a number of other instruments, including sitar, woodwinds, brass, and percussion. The vocals are often more shouted than sung, and touch on social and political topics as well as personal ones, so they often resemble the chanting at a protest march. Some highlights are the sitar-driven “Orthodoxy,” the messed-up funk of “Freak Freak Freak on the Peripherique,” and the oddball grooving of “Oral Sidney with a U.” I’m going to call it all Global Freak-Rock, and leave it at that. Probably not for everyone, but if you’ve got a tolerance for edgy noise and a fondness for non-rock elements tossed in, YRU Still Here? is a fascinating release.